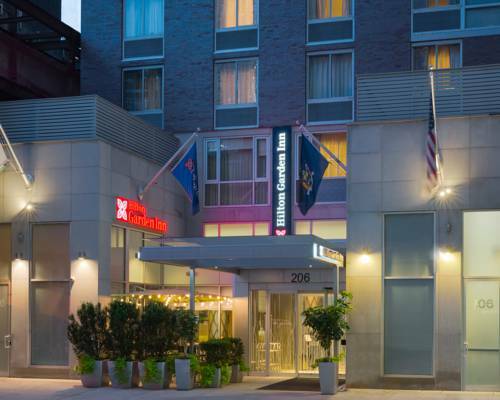 Hilton Garden Inn New York/Manhattan-Midtown East boasts a fantastic location in the heart of Midtown Manhattan. just minutes from extensive shopping lively restaurants and bars the bustling Theater District and the iconic Rockefeller Center and Radio City Music Hall. The United Nations Headquarters the Chrysler Building Times Square and many other New York attractions can all be easily reached from our welcoming hotel in Midtown Manhattan NY. Unwind in a spacious guest room equipped with a microwave a mini-refrigerator and a coffeemaker. Stay connected with complimentary WiFi at the large desk which features an ergonomic chair and desk level power outlets and ports. Play music through the alarm clock radio with MP3 connection watch movies on the HDTV and enjoy a great night*s sleep on the plush bed with hypoallergenic pillows and crisp white linens. Maintain your exercise regime at this hotel in Manhattan NY in the complimentary 24-hour fitness center. Start your morning with a cooked-to-order breakfast and buy drinks snacks and essentials in the 24-hour Pavilion Pantry. Unwind by the fireplace in the welcoming lobby lounge as you enjoy a cold beer or a glass of wine before savoring delicious American cuisine in the relaxed Garden Grille - Bar. If you would rather dine in the comfort of your guest room we also offer a tempting Room Service menu. Keep in touch with the office in the complimentary 24-hour business center which offers services including faxing and printing or hold a small meeting in our naturally-lit board room. Reservations must be cancelled 24 hours prior to local time to avoid penalty. Policy is subject to change. A freshly prepared breakfast is offered daily in the Great American Grill restaurant. The Pavilion Pantry convenience Market offers sundries an assortment of beverages and ready to cook meals bound for the in-room microwave oven or refrigerator. The scary place where owners of New York City's "American Girl" dolls go to have their toy's hair styled.